The Hitachi research-grade AFM5300E offers significantly improved sensitivity, accuracy, and resolution of electromagnetic property measurements operated under high-vacuum conditions. 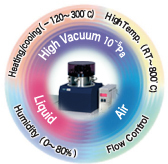 Furthermore, it establishes a benchmark for comprehensive environmental control and is the only tool on the market affording AFM imaging in air/liquid/vacuum, a broad temperature range (-120 C to 800 C), magnetic field or humidity controls, as well as correlated AFM/SEM/ion milling investigations. 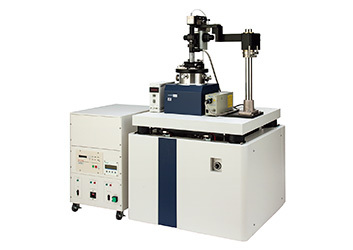 An environmentally-controlled atomic force microscope for observations under various conditions, the AFM5300E allows surface measurements in AIR, LIQUID, or under VACUUM. Robust temperature control via the "surface-shifting temperature monitor" enables real-time quantitative and qualitative measurements of surface properties as a function of temperature. The AFM5300E measures samples in environments that cannot be measured by conventional atomospheric SPMs. It supports electric measurements under a high-vacuum environment in which you can minimize the influence of surface moisture. It also supports material-characteristic mapping of samples under heated and cooled conditions. 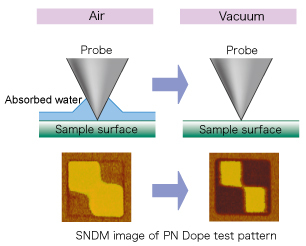 The newly developed "Temperature Sweep Function" monitors measurements off the measurable Z-axis range due to the thermal expansion or shrinkage of samples and provides feedback control, so that the material characteristics can be continuously measured by keeping the cantilever in touch with the sampel surfaces (Japan Patent Nos. 3857581 and 3926638). The open/shut function of the integrated holder flange simplifies the insertion/replacement of samples and the replacement of the scanner, eliminating the need for tools. It is no longer necessary to adjust the optical axis after sample replacement, which has been a must for the conventional environmental-control SPMs. Furthremore, it even elimintes the need to replace the holder when switching measurement modes. The "Swing Cancel" Function minimizes the swinging of the samples to reduce the drift (under 0.015 nm/sec). The reliability has been improved by enhancing the basic performance critical for nano-order structural analysis. When observicing electrical characteristics, resolution may be affected by the influence of moisture on the sample surface or probe. The AFM5300E eliminates moisture and contaminants on sample surfaces in the vacuum state, and makes it possible to observe high-resolution, high-sensitivity images.